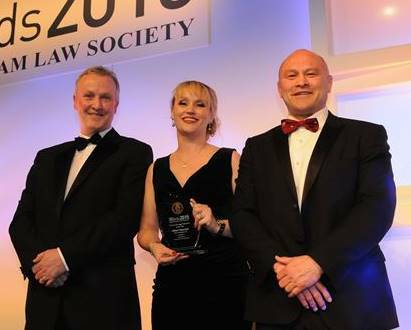 A Fellow of the Chartered Institute of Legal Executives (CILEx) and Partner at law firm SGH Martineau triumphed at the Birmingham Law Society Legal Awards last week winning the Chartered Legal Executive of the Year title. Alison Hancock celebrated her success at an awards ceremony on Thursday, 19 March at the International Convention Centre. On winning the award, Alison said: “I was honoured to be nominated and thrilled to win - especially with such a high level of competition. CILEx is a fantastic route to becoming a qualified lawyer as it allows you to gain experience whilst learning on the job; it actively promotes greater diversity in the law. Alison is a Partner in the Real Estate Disputes team at SGH Martineau having joined the firm in 2003. She is also a member of the Property Litigation Association. Alison, who was state-educated, left school at 16 to enter the world of work as an office junior in a law firm. She progressed her career through studying the CILEx qualifications part-time and was admitted as a Fellow in 2000. The Chartered Legal Executive of the Year category was sponsored by the University of Wolverhampton who are accredited by CILEx to deliver the professional qualifications to become a Chartered Legal Executive lawyer. Photograph L-R: Miceal Barden, Dean of the Faculty of Social Sciences at University of Wolverhampton; Alison Hancock, SGH Martineau; Brian Moore, former England rugby player and guest speaker at the awards event.